Three shots and three goals. That was all it took for Glenavon to lift the Mid-Ulster Cup with victory over Newry City AFC at The Showgrounds. Andy McGrory was on target for Glenavon from the penalty spot. Championship side Newry were the better side on the night but it as Gary Hamilton’s mix of fringe players and experienced heads that were more clinical. Keith Johnston gave Darren Mullen’s hosts and early lead but Andy McGrory levelled from the penalty spot before half-time. Then second half strikes from Stephen McCavitt and Man of the Match Jack O’Mahony secured the trophy for the Lurgan Blues. 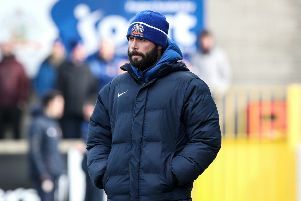 City took the lead after just three minutes when Mark McCabe flicked a header into the path of Johnston, and with the striker in acres of space, he was the coolest man in the ground to slot the ball under Glenavon keeper James Taylor. Despite City’s dominance, they conceded an equaliser five minutes before the break after a mix-up between goalkeeper Steven Maguire and defender John Boyle led to a Glenavon penalty. A diagonal ball to just inside the box saw Maguire and Boyle both go for it with Glenavon striker Jordan Jenkins in the middle. A combination of both City players flattened Jenkins and referee Jamie Robinson had no hesitation in pointing to the spot and Andy McGrory sent Maguire the wrong way from 12 yards. It took the visitors just seven minutes after the break to go in front when McCavitt a fired a superb finish past the helpless Maguire and into the top left hand corner. The Lurgan Blues then sealed the victory on 87 minutes when Jack O’Mahony slotted past a helpless Maguire.